As an accounting professional, “WOW” your prospects and clients by learning how make your presentations memorable and help you stand out. The purpose of this article is to introduce you to the useful purposes of selected tools used to create and deliver winning training or sales presentations. 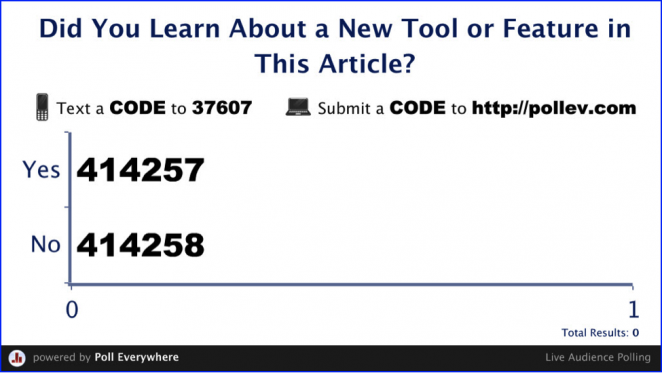 However, it is beyond the scope of this article to do a detailed, step-by-step guide for each of the tools. 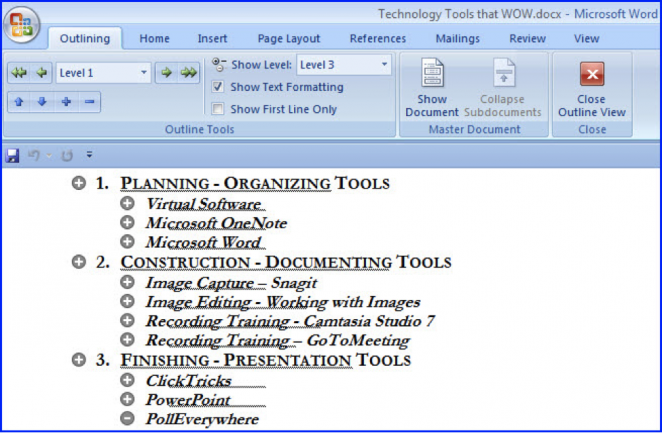 Most of the tools featured here offer their own training documents, often created using these same tools. It is also worth mentioning that I have only introduced you to a few of my favorite products. Go look for yourself; there is a wealth of information available on this topic on the Web. So sit back and enjoy! Get ready to “WOW” your prospects and clients and truly differentiate yourself from others. Included in this article is a link to a completed tutorial so you can see for yourself the end product. Happy selling and consulting! Any construction project takes some planning; use these tools to help you get organized. Beta Testing: With software beta testing, you can test and “throw away” that version when beta testing is completed. Yes, the “computer” is just a folder that can be tossed away when not needed. Screen Capture: Virtualization offers the ability to set the screen capture or recording resolution to 1024 x 768 (best). At the same time, continuing to work on my host machine in its native resolution. Create a Snapshot: For example, in a sales demonstration, I will create transactions so my data will not be clean for the next demo. With virtual software, I create a snapshot before the presentation. After I am finished, I select “revert to snapshot” and the data file is as it was before the transactions. I’m ready for the next demo in just mere seconds. Very cool feature. Create a Reusable Template: You can create a virtual template with all of the basic software you use all the time. Keep the template updated and it will be ready to use over and over. Be sure to review each of the individual software’s licensing policy in order to remain license-compliant. I recommend using VMWare Workstation 8 and I have enlisted the help of Hales Technologies to set up the software initially. A similar virtual product is available with Windows 7 Professional or Windows 7 Ultimate Software. Storing Information: I use OneNote when I beta test software to organize the information collected about the new software feature and how it works. Often, I will copy and paste beta testing activities because they often represent the desired outcome of a new feature. I keep track of email contact names, websites and even store images in OneNote. Presentation Research: When I create a presentation, I do research and often find “gems” that I may not need immediately, but I store them in OneNote. It might be just a link to a website, a PowerPoint presentation or some other random thought. No Formatting Restrictions: Unlike a Word document that guides you in your formatting, OneNote allows you to copy and paste any type of formatted document, image, video clip and other items, akin to just putting a piece of paper in a folder. Search and Task Ability: When I need to find something, I can search all my digital notebooks and can even create Outlook tasks. Outline Mode: Starting every document in outline mode allows you to see the overall structure much more clearly. From the View Ribbon, select Outline in the Document Views pane. A quick trip to the Word help menu will teach you how to use this feature. Document Templates: Create a customer training document template with the font, formats, headers, footers and tabs that you desire. File, Save as Type, and choose the Word Template type. You can then assign this template for your new document from the Developer ribbon. Styles: Styles are pre-prepared so that your document looks professionally typeset. Use the keyboard shortcut Ctrl+Shift+S to Apply or Modify a particular style that holds the defaults for font, format, spacing and many other settings. Macros: They are easier than you think to create. If you find yourself repeating a similar task, i.e., adding a caption to a picture or entering a comment, create a macro. From the Developer ribbon select Record Macro, and with just a few tries, you will see how easy it is. I then add these to my Quick Access Toolbar in Word. After research is done and you have your outline, use these tools to efficiently create your presentation or training document. Your “quality” presentation will truly differentiate your services from others. Create Profiles: Profiles define the input, output and effects of your screen captures. They can save you a lot of time! I create a profile that sends the screen capture to a Word document automatically. During a customer training session, I add notes to the images and then send the document to customer as a follow up to our session. These documents often prove to be more useful that the client’s own notes during the training session. Set Hotkey: Uses keyboard shortcuts to capture images quickly. Batch Convert Images: Convert to a single file format, and add a watermark, border or other element to multiple images at one time. 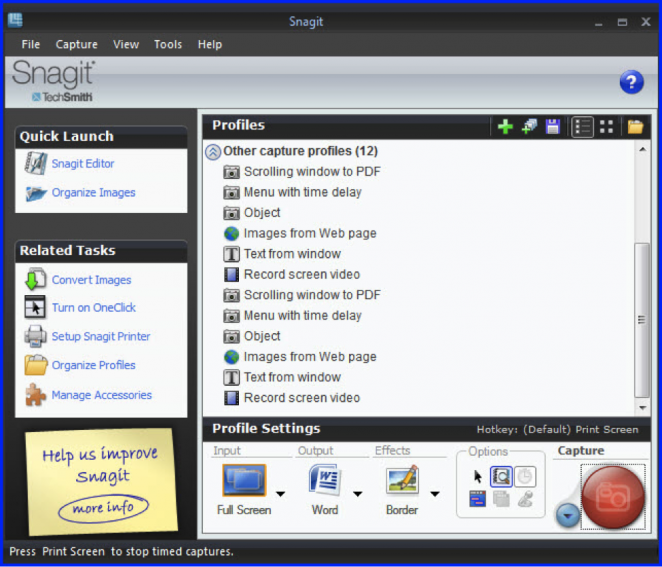 Stored Images: Snagit automatically stores captures and allows you to assign keywords and flags for searching and filtering images. One of the most time-consuming tasks can be manipulating images to meet your specific presentation or document needs. When I am writing a technical manual, I choose to capture the entire screen. When I am creating a process manual, I will often just capture a region. In both scenarios, I often need to edit the resulting image. Viewing Images: Your tool for viewing your images may differ depending on your image type. I capture using PCX and I choose to view the images using IrfanView. Snagit Editor and Library: I use Snagit Editor to resize, crop, add callouts and lots of other “fun stuff” to images. Proper Equipment: Your effort takes time, so get the best in equipment. I rely on dual monitors, one for the actual recording and one for my script, as well as a good recording microphone. I prefer the CAD Audio USB Studio Recording Microphone as compared to the headset variety I have used in the past. I particularly like the little blue light that blinks when I am recording; this keeps me from recording audio and then finding out it didn’t actually record. Remember, I did say there was a learning curve. Quiet Room: Test your recording by recording nothing, and then play it back to hear all of the ambient noise you didn’t even notice. For example, I have to turn off my office fan because it “hums.” Be aware of other possible interruptions, pets do not know what you are doing, but I can tell you mine dogs are at my feet during my recordings! Be Relaxed and Speak Clearly: Being rested and prepared are very important when recording. During your recording, imagine you are talking to an audience be mindful of your voice inflections and the need to create variety in your recording. 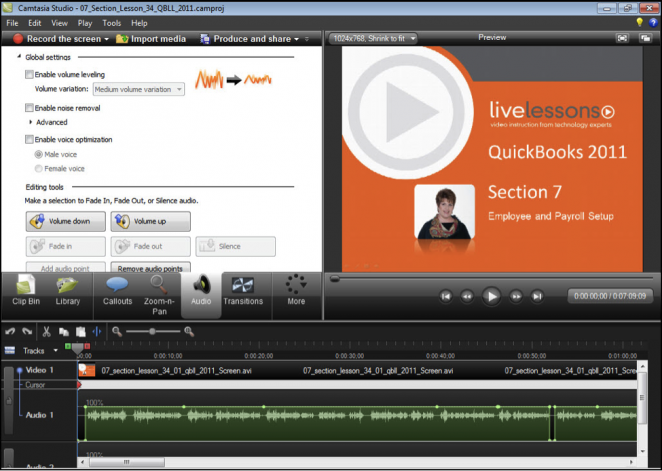 Sharing Recordings: Camtasia software allows you to produce your recordings in a variety of shareable formats, including YouTube, iPhone, iPad and others. You can also use TechSmith’s Screencast.com to store your high-quality videos and link to them for others to view. Would you like to view a completed Camtasia recording? 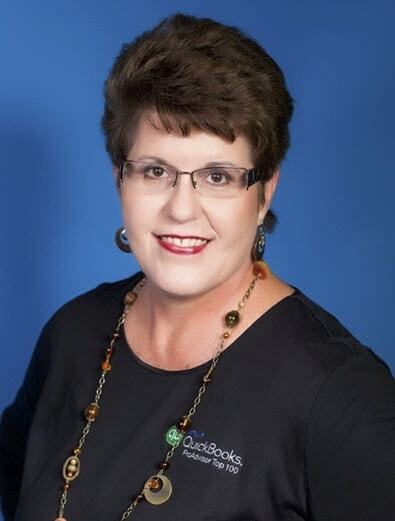 Click on this link to view the features of working with Intuit Statement Writer 2011. This recording took some effort and I used most of the tools I have mentioned in this article. Do you use software to remotely train your customers? Many remote access programs, such as GoToMeeting allow you to record the video and audio of your meeting to later share with the participants. You may want to try this during your next session and then listen to it; you can learn a lot about your training and presentation style by listening to yourself. Whew, you have done the work, so why not show it off? I couldn’t successfully present without the following tools and I make sure that I have a backup of them on a USB in case I have to use someone else’s computer for a presentation. Your presentation will be easier to see using Southpac’s ClickTricks software or something similar. With ClickTricks, you can enhance your presentation with various effects, including zoom, spotlight and countdown timers. Use your mouse as a pen to draw on your projected image even access software applications or web pages with a simple click of the mouse. I personally use the countdown timer during Q&A; it keeps track of the time allotted and prevents me from going back into the software to show the answer, when often just telling the answer is sufficient. Actions in PowerPoint: Add links to your software, an Internet site and even another document. Hint: Use white ink for the text then you simply place your mouse in that area during the presentation and click to engage the action … the transition looks seamless to the audience. Custom PowerPoint Actions: Add some variety to your presentation by including unique images or actions available from Microsoft for free. Wouldn’t you like instant audience feedback on how you are doing during your presentation? Is your audience too uncomfortable to provide honest feedback during the presentation? Or, are you training online and you do not have the privilege of seeing their raised hands? Try using PollEveryhere, in which you create a poll online. For example, you might create a Yes / Maybe multiple choice poll, such as: “Did you learn something new today” or “As a result of the training are you going to do something different?” You display the poll in your PowerPoint, have the audience text or tweet to a specific number and code, and in real time during the presentation your audience sees the results to the poll. Text 37607 with one the following codes: YES: 414257 NO: 414258. Standard text message rates apply, responses are anonymous, and no record is kept of your mobile device used to text. Click to check out the PollEverywhere results for this displayed poll. Free PollEverywhere account will only track the first 30 responses. You have much to offer as a technical consultant. Using technology tools that “WOW” can help your presentation be memorable and help you differentiate your services from others. Happy selling, training and presenting!